Use ICOR’s Self-Declaration of Conformity Process to meet third-party needs to demonstrate that your organization is prepared to deliver its goods and services. Use the ISO 22301 Maturity Model to demonstrate to top management current BCMS status focusing on strengths and weaknesses. Self-assessment process is applicable to organizations of all sizes and in all sectors. Don’t have an internal audit program? Take advantage of ICOR-credentialed and ANSI-Accredited ISO 22301 Lead Auditors to conduct an internal audit for your organization. Conduct self-assessment using the ISO 22301 Maturity Model. ISO 22301 Lead Auditor Reviews Application. The self-declaration process was initially developed in support of the US Voluntary Private Sector Preparedness (PS-Prep™) Accreditation and Certification Program for small businesses. It has been expanded to support organizations of all sizes and types. Self-declaration of conformity means that an organization issues a statement based on its own determination that upon review of its business continuity management system it has met all the specified requirements in ISO 22301. Rather than seeking formal third-party assistance to prove it, the organization is retaining the responsibility for testing. The burden of proof that the organization has met all the requirements of ISO 22301 remains on the organization. Questions? 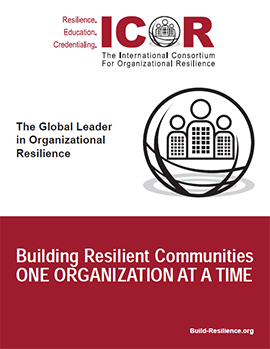 Contact ICOR by phone at +1630.705.0910, toll free North America 866.765.8321, or by email at ISO22301@theicor.org.